The 2013/2014 second semester examination results for Unilag undergraduate students are now available online. All students of the prestigious institution who wrote the recently concluded 2nd semesters exams are now advised to check their results online. From experience, I know some people don't know or would have forgotten how to check the results online. That is why I decided to guide you in this post. 1. 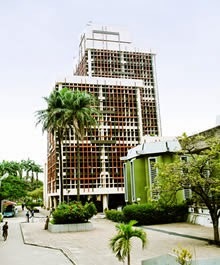 Visit the Unilag Official website (www.unilag.edu.ng) and locate "Student Records" under Students Login. To make it faster and easier, you can just Click 2013/2014 Unilag 2nd Semester Result to skip step 1 and 2. Use the comment section below for related discussion or question I'll reply asap. Stay in touch with Tayo Lawal for more info and regular news updates, click Quick Access To Tayo Lawal's Updates and follow the instruction.